If you love tanning, you probably recognize the koala on a surfboard, the mascot of Australian Gold. This company has been creating suncare products since 1985. But even though their name sounds like they’re from Down Under, they are a subsidiary of an American business based in Indianapolis. 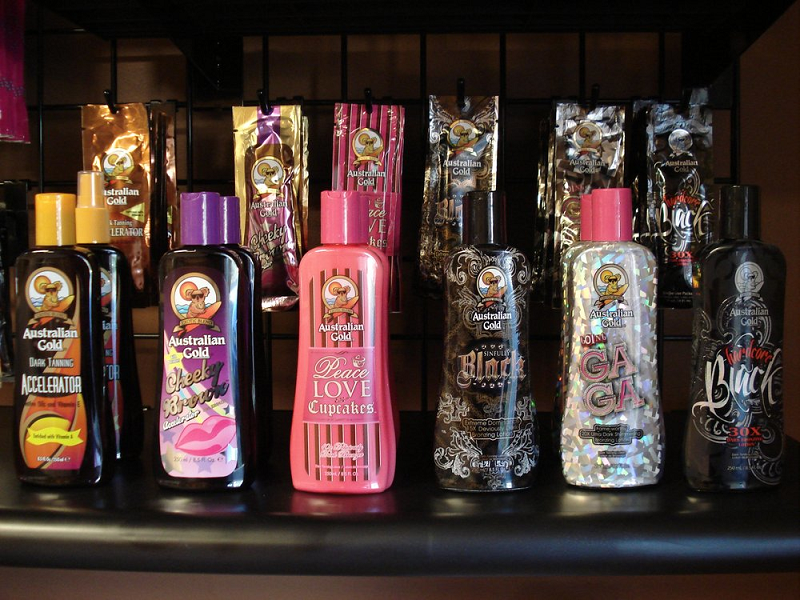 Australia Gold offers a wide variety of suntan lotions, from bronzers and tanning accelerators to tan extenders. Their product lines are diverse, including products from Jwoww, Jenni Farley from MTV’s Jersey Shore, and Hemp Nation. We selected some of the best ones for our review today. This isn't a comprehensive list since they frequently add new products. This is merely a selection of some of their best, most popular lotions. Our first pick is the one you’re most likely to see when you visit a tanning salon. The Australian Gold Dark Tanning Accelerator may be the most popular tanning lotion sold today. It’s a versatile product so you’re not wasting your money on a specialty item. Buy one bottle and you can enjoy it outdoors in the sunshine, or indoors in a tanning bed. The formula has Australian Gold’s Biosine Complex that combines protection, moisturization, and nourishment for your skin. Tanning can be damaging to your skin, so the Accelerator works to avoid age spots and wrinkles while it helps you get the deep bronze you crave. It smells great, too, like a tropical vacation in a bottle. That scent chases away any after-tanning odor. The Australian Gold Bronze Accelerator combines the benefits of the Dark Tanning Accelerator above with an immediate bronzer. You’ll look tan as soon as you put it on your skin, with no streaks or orange blotches (Just be sure to wash your hands after you rub it in for best results). The formula has the Biosine Complex with its nutrients and moisturizers along with Propolis extract and vitamins, but no mineral oil. That means this lotion is also safe to use for indoor tanning because it won’t damage the acrylic on beds. It’s also a treat for your skin, with a blend of ingredients that neutralize free radicals before they can cause signs of aging. Like all of the lotions we chose, this one has a pleasant scent that takes away the after-tanning odor. The Cheeky Brown Accelerator also contains bronzers (henna and caramel) that will give you an instant tan without streaking. The formula contains ingredients that soften and smooth your skin and protect against undesired after effects of tanning, like wrinkles. Besides the bronzer, the label lists the Biosine Complex that prepares your skin for tanning, Herbal DNA to help skin retain moisture, and aloe plus Vitamins A, E, and B5 to keep signs of aging at bay. If you’re not a fan of lotions, try the Gelee Dark Tanning Accelerator. It has the lightweight feel of a gel and it absorbs quickly. It encourages your skin to tan as dark as it can. The hemp seed extract in this formula keeps your skin hydrated and soft while Vitamin E protects you from wrinkling. When you’re serious about tanning, a base builder is a good place to start. It will help you achieve a gradual tan with the goal of protecting your skin from aging as you darken in color. The soft pink Eye Candy base builder lotion contains 15x bronzers with caramel and DHA. This means you’re instantly bronzed when you apply it, and your tan will darken over time, too. The caffeine in the formula speeds up tanning by increasing circulation. It also helps tone skin. The brown sugar, strawberry extract, shea butter, and natural oils keep your skin healthy and soft. The Jwoww Black Bronzer instantly darkens your skin tone with a mix of black currant, caramel, and walnut shell extract so you look ready for the beach as soon as you smooth it on. The vitamins, Kukui oil, and hemp seed extract will keep your skin soft and protect you from developing fine lines. The Sinfully Black Deep Dark lotion also contains an instant bronzer based on black currant oil. This ingredient helps make up the Temptuous Berry fragrance that’s addicting for some users. While you’ll look darker as soon as you apply it, the mix of oils, aloe, and vitamins will keep your skin soft while you soak up rays. These lotions are called “event tanners” because they are made for people who have a short amount of time to enjoy in the sun, like on a vacation. Most have bronzers to make you look sun-kissed as soon as you smooth them on your body. Jwoww packages together tattoo protection with skin softeners and an instant bronzer so you’re ready for the sun right away. The JWOWW Natural Black Bronzer with Ink-Drink Complex has everything you need, and it smells fantastic. As soon as you rub in the lotion, the bronzing formula darkens your skin. You won’t be too pale to show off that new swimsuit. Kendi oil and Jenni’s Signature Skincare Blend make your body touchably soft and visibly smooth and radiant. The Ink-Drink Complex combines vitamins with shea butter, beeswax, and raspberry to save your tats from fading. The Deviously Black Lotion gives you an instant bronze that continues to darken over time. It has DHA to intensity your dark color even after you leave the sun behind. If you’re worried about the sun drying out your skin, don’t fret. The hemp seed oil plus the Twisted Skincare Cocktail with Absinthe protect it from dehydration. This is another lotion designed to protect your favorite tattoos from fading. It has ColorGuard Plus technology with tiger grass and cocoa butter to keep tats from drying out and looking dull. The Pretty Fierce formula also darkens your skin instantly with its Bronzing Blend. The DHA will continue to darken your color in the hours to come. If you’re worried about hiding a little cellulite or acne scars, the Purrfection Finish Primer blend helps disguise those. If you’ve been tanning for a while and can’t seem to get any darker, try one of these plateau breaker lotions. The On the Prowl Advanced Bronzer Tanning Bed Lotion hides those little imperfections you hate and gives you a sun god-like look from the moment you apply it. It has the Purrfection Finish Primer blend that evens out your skin tone and texture. The Fierce Color Complex gives you a streak-free bronze with DHA and erythulose so you develop a deeper tan over time. But this lotion isn’t just about color—it has plenty of moisturizing ingredients like vitamins, oils, and herbal extracts to soften and hydrate your skin, and neutralize those pesky free radicals that cause aging. Rock Culture will take you past your plateau and into a new darkness you’ve never seen before. The formula has a special blend of instant and slow-developing bronzers that continue to darken your skin a long time after you leave the sun behind. But a deep, dark tan isn’t the only benefit of Rock Culture. It will give your skin a fabulous shimmer with its mix of diamonds, pearls, opals, and turquoise plus copper. And it’s also happens to be paraben-free. Jwoww’s One and Done White Bronzer lets you get darker without fading your tattoos. It contains an instant bronzer based on black walnut extract, but the color also deepens over time with the help of DHA and erythulose. The idea is to help you get as tan as possible in just one session. After you’ve done the work to soak up those rays, you want your tan to last as long as possible. While other vacationers are fading back to pale, you’ll be the one with a healthy glow still if you use these tan extenders. Hemp Nation is part of Australian Gold, and their Original Moisturizer Tan Extender is the perfect way to stay bronzed for as long as possible. The mix of hemp seed oil, shea butter, and jojoba keeps your skin silky soft so you don’t peel and lose all that hard work. Vitamins A, B5, and E neutralize the free radicals that UV rays can cause, protecting against signs of aging. Hemp Nation’s Pomaberry Tan Extender has all the great features of their original formula plus Superfruit Extracts. These derivatives from pomegranate, acai, and goji berries are intensely rich in antioxidants to protect your skin from aging and keep it super soft and moist. Forever After also contains the rich moisturizer hemp seed extract plus a powerful anti-wrinkle and skin firming ingredient complex. It smells like creamy vanilla and hydrates skin for up to 24 hours. You’re anxious to get that healthy, sun-kissed glow. But don’t neglect these few tips so you can tan as safely as possible and enjoy your new look for longer. Exfoliate before you sunbathe or have a session in a salon. Get rid of dead, dry skin and you’ll absorb rays faster. Don’t be afraid to lather on sunscreen, especially if you’re pale. You’ll still tan and you’re less likely to burn, or end up with skin cancer years from now. Apply your tanning lotion on top of your sunblock and you’re good to go. Bronzers will make you instantly look like you’ve been out in the sun. They are a great choice when you don’t have time to build up a base tan before you hit the beach. Wear goggles at the tanning salon and sunglasses outdoors to protect your eyes. After you’ve soaked up the sun, remember to stay hydrated and moisturize your skin so your new tan lasts a long time. Australian Gold has a tanning lotion for everyone, from novice to expert tanners. Their bronzing lotions are great if you’re trying to hide how winter pale you are. Their tanning accelerators are popular in salons all around the world. The delicious tropical and fruity scents keep that after-tanning odor away while their moisturizing formulas hydrate and soften skin. We hope you found the perfect tanning lotion today to help you keep the bronze you crave. Check back soon to see new reviews of top tanning products and the best in skin care essentials.